When we saw League's newest champion — the oh-so edgy "Shadow Reaper" Kayn — we were admittedly a little underwhelmed by his rejected Devil May Cry concept art aesthetic... at least until we heard his voicelines and discovered his Darkin scythe, Rhaast, is a sarcastic douche that loves to take the piss out of his self-serious wielder. In honor of Kayn and Rhaast's introduction, theScore esports decided to rank League of Legends' best champion interactions. 10. Master Yi to Wukong: "Quit monkeying around!" We at theScore esports are suckers for bad puns, and we have to admit, this is a pretty bad pun. I mean, puns might be the lowest form of comedy but monkey puns have to be the absolute lowest of the low. As such, how could we possibly avoid giving a spot on the list to Master Yi telling Wukong to "Quit monkeying around." 9. Sion to Jarvan IV: "How many Jarvans must I kill?" 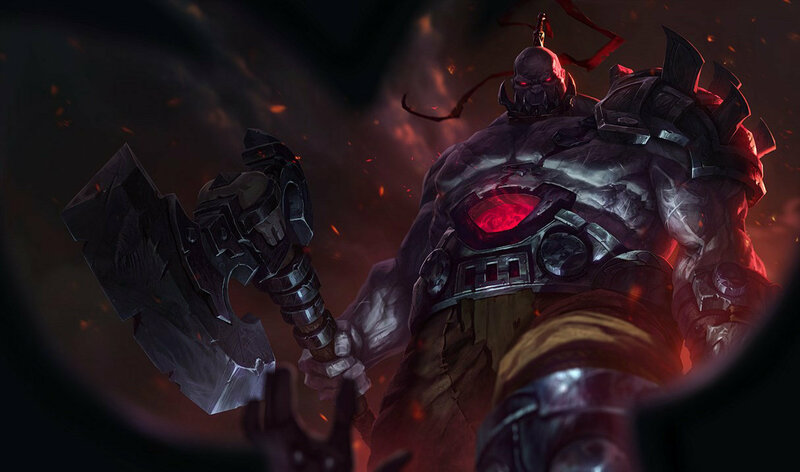 As Noxus' ageless undead champion, Sion has faced several generations of Demacia's royal family in battle and has even murdered several members of it. What's more, he's not at all shy about gloating about it considering he has several voice lines taunting Jarvan the IV about killing his forefathers. These include "You look just like your ancestor: dead!" and my personal favorite, "Four Jarvans, and you're all still failures! That is funny." 8. Primetime Draven to Draven: "Did you know Draven can catch another Draven's axes? Ha ha! You should read the hints more often!" This interaction is great because it's informative as well as funny. 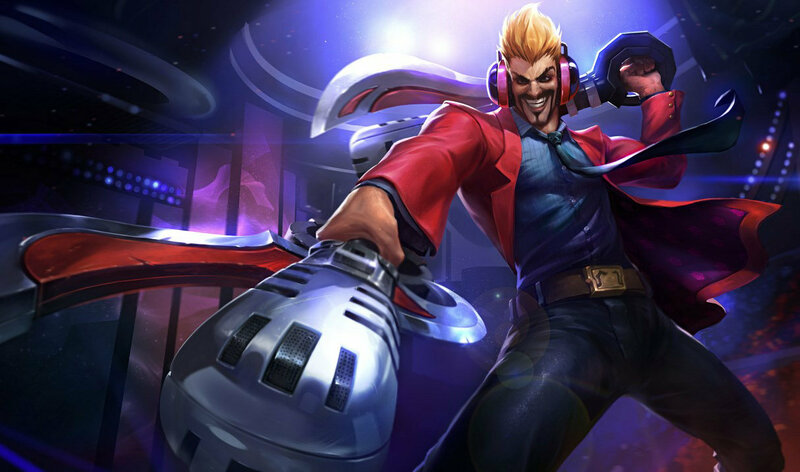 Dravens can catch other Dravens' axes even when they're shaped roughly like old-timey microphones. Who needs tooltips when you have a skin that lets your favorite obnoxious champion cosplay as an obnoxious shout caster? 7. 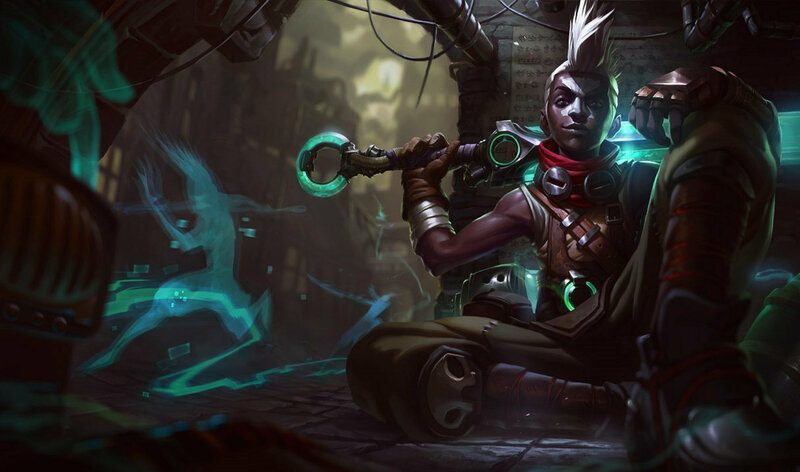 Ekko to Vi: "You used to be cool." You know what's even cheaper than pun humor? Reference humor! While Ekko's numerous taunts to former fellow Zaun city street thug Vi about going straight are kind of yawn, this sly little reference to one of the better flash-forward episodes of the Simpsons makes up for them. Bonus points for the fact that said Simpsons episode took place in the future since time travel is Ekko's whole gimmick. 6. Braum to Alistar: "Alistar! I have cow you should meet." 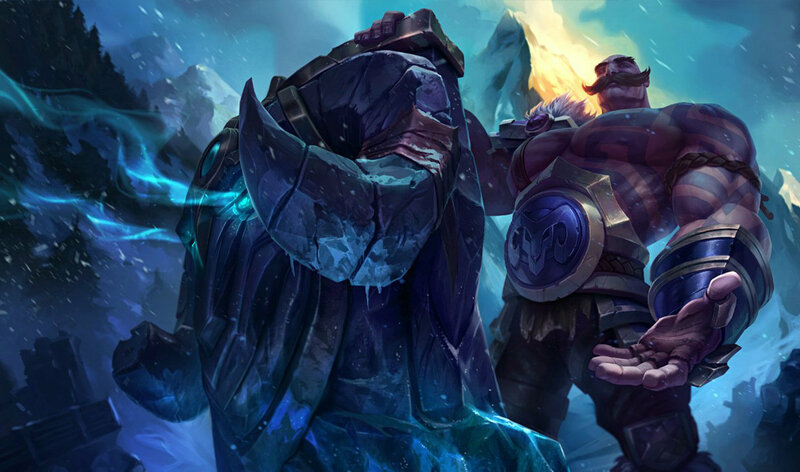 While most of the interactions on this list are savage, personal taunts, Braum the Heart of the Freljord is just too good-natured to intentionally insult anyone. That's why it's particularly tickling how he genuinely wants to introduce Alistar the Minotaur to Agatha, the "Best cow back home," not realizing Alistar might not take the offer in the same generous spirit. 5. Dunkmaster Darius to Draven: "Hey Draven! Momma said you were adopted!" 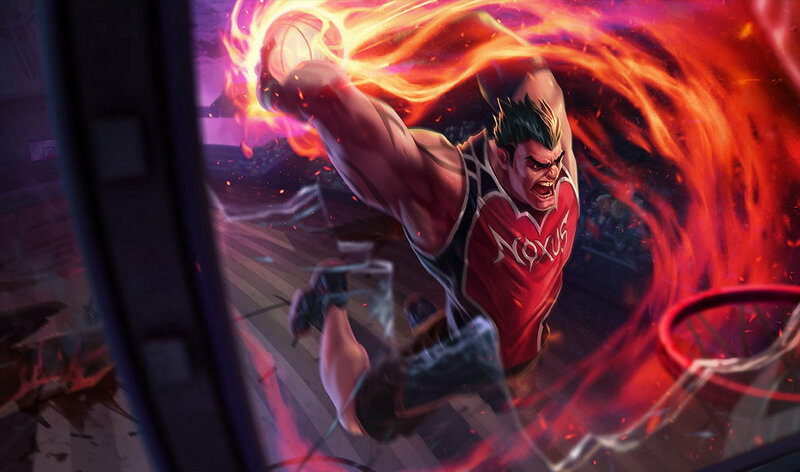 Dunk Master Darius might be the most savage champion in League with no less than 30 Taunts under his belt. However, by far the cruelest, mean-spirited, funniest of them all is when he tells his own brother Draven that he was adopted. When Riot give a champion a lore-breaking, anachronistic skin, they commit to the bit. Take Forecast Janna for example, who begins every match as though it were a stand-up on a local news channel, announcing she's live at the scene and hoping she stays that way. She also actually reports on the weather in each battlefield, even when it's pretty redundant. "It's going to be another beautiful day in Summoner's Rift! Again," she says. Additionally, when Nocturne activates Paranoia, she comments on the "unknown weather pattern" and when the Baron throws a bunch of acid at you she tells the viewers at home to watch out for acid rain. Do you think love can bloom on the Summoners' Rift? Super Galaxy Rumble certainly hopes so, considering his incredibly thirsty recall interactions with Tristana. 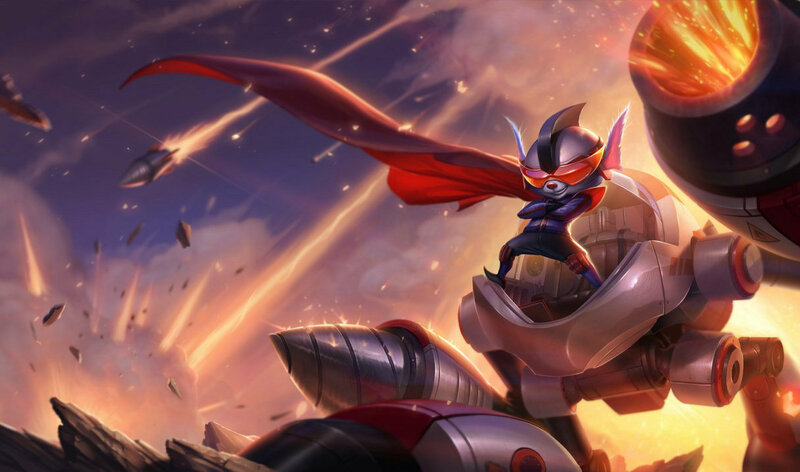 Even outside his Gurren Lagann-inspired skin, The Mechanized Menace's crush on Tristana is a long-standing thread in League lore, particularly considering the fact he named his mech "Tristy." Sweet? Schmaltzy? Weird and obsessive? That probably depends on how he responds when she asks, "Nice suit, Rumble! What d'you call it?" 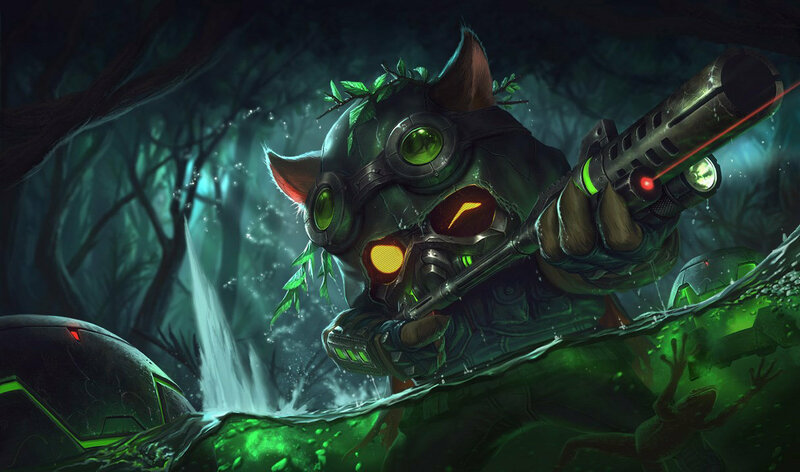 Omega Squad Teemo is the objective best skin in the game, transforming the happy-go-lucky Yordle scout into a bitter, scarred war machine. Every single thing that comes out of this character's mouth is comedic gold, however his attempts to educate less battle-worn Yordles in the laws of war are friggin divine. Between admonishing Heimerdinger and Corki for their reliance on machines and Tristana for misusing her rockets, he tells Amumu — who is, yes, a Yordle — "My tears have all dried up, kid." Upon encountering the pre-historic Yordle, Gnar he also comments, "Little guy's gone native," which is a little concerning considering the character's Apocalypse Now overtones. 1. Kayn killing Zed, Rhaast: "Zed's dead baby. Zed's dead..."
Maybe it's a little presumptuous to give Summoners Rift's latest newbie the top spot, however we just can't bring ourselves to low-ball a Pulp Fiction reference. You see, though Kayn is Zed's disciple in the school of miscellaneous evil ninja magic, when push comes to shove and it comes time for the student to reap the master, Rhaast can't let the solemn moment pass without comment. The line is a reference to Bruce Willis' character in Pulp Fiction, who summarizes his horrific encounter with a corrupt cop in a pawn shop basement/dungeon with the understatement of the century.